Ex-combatants from the Colombia’s demobilized FARC group are recreating a guerrilla jungle camp to show tourists what their life during the conflict was like. Visitors can stay in what was essentially a FARC camp and sleep in temporary-style huts that combatants endured during the course of their armed struggle against the Colombian state. The organizers also hope that the tourists will be given the opportunity to sleep in the pre-fabricated houses provided by the government as part of the historic peace deal in order to gain an understanding of the changes that took place through the agreement. The project was started by 19 ex-combatants in June this year when the “Tierra Grata Ecotours” company was set up with the idea of promoting tourism centered around the ongoing peace process. 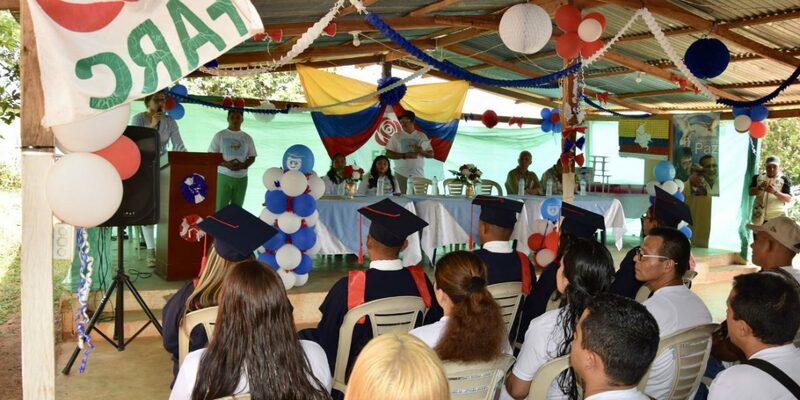 The former guerrillas have received training from several institutions and organizations such as SENA, Valledupar Chamber of Commerce and Procolombia where courses relating to business and tourism were on offer. The ex-fighters, decorated the prefabricated houses that were built for them in accordance with the terms of the peace deal with murals alluding to the history of the guerrilla group that fought against the State for more than 50 years. For months, the former combatants have been training and rehearsing for the reception of tourists that will be invited to converse and ask questions about life in what was for decades Colombia’s largest guerrilla group. The camp has a kitchen with a “Cuban stove” that was used by the rebels during the conflict with the idea being that visitors can try dishes that were the basis of a guerrilla diet during the war. In addition, the project organizers hope to build a house of memory to pay tribute to the victims of the conflict, which will be open to tourists in the future. “The memory house has to be oriented towards recognizing and making the victims visible. It is not about making an apology for the conflict,”said German Gomez, an ex-FARC commander. Since the signing of the historic peace agreement and the subsequent laying down of arms by the FARC, new projects are springing up around the county as ex-combatants try to reintegrate into society after decades of conflict. “These projects dignify the human being and give them the option of growing,” explained Gomez at the La Paz site. FARC’s armed struggle against the state began in 1964 playing a role in a wider armed conflict including right-wing paramilitaries and state forces that cost the lives of 260,000 people. Peace talks are currently ongoing with Colombia’s last remaining Marxist-inspired rebel group the ELN.